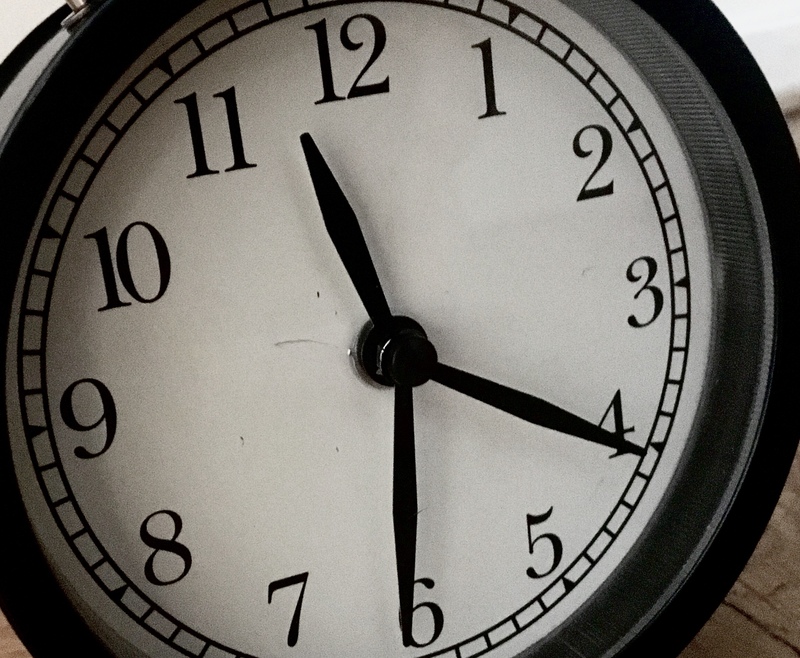 If you want to build something that is going to last, you rarely get far by cutting corners. Even if what you want to build is a round tower. Maybe that is why King Christian IV (1577-1648) did not take any shortcuts when he built the Round Tower. 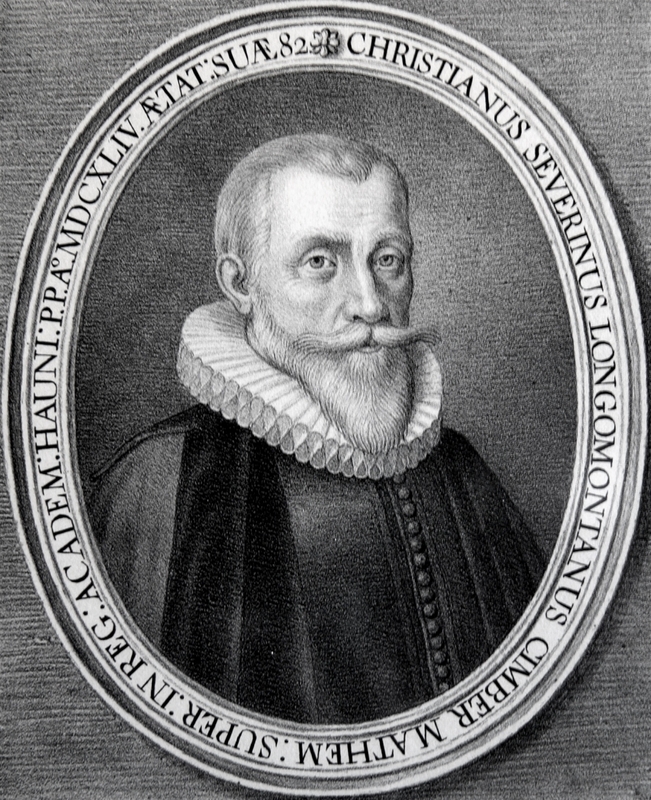 The obvious choice would have been to place the university’s new observatory, which the Round Tower was to house, at a reasonable distance from the vibrant capital and the smoke “which is spouted out everywhere from the wood burning stoves”, as formulated by the astronomer Christen Sørensen Longomontanus (1562-1647). But Christian IV wanted things otherwise. Perhaps because it was convenient to place the observatory close to the university, and perhaps because a building right in middle of the city would be able to show the whole world that the King supported science and the exploration of the creation. It has even been suggested that the Round Tower could have been intended for some kind of military purpose. 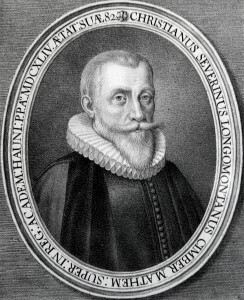 Longomontanus was the right person to ask, though, because he had plenty of experience with observatories. 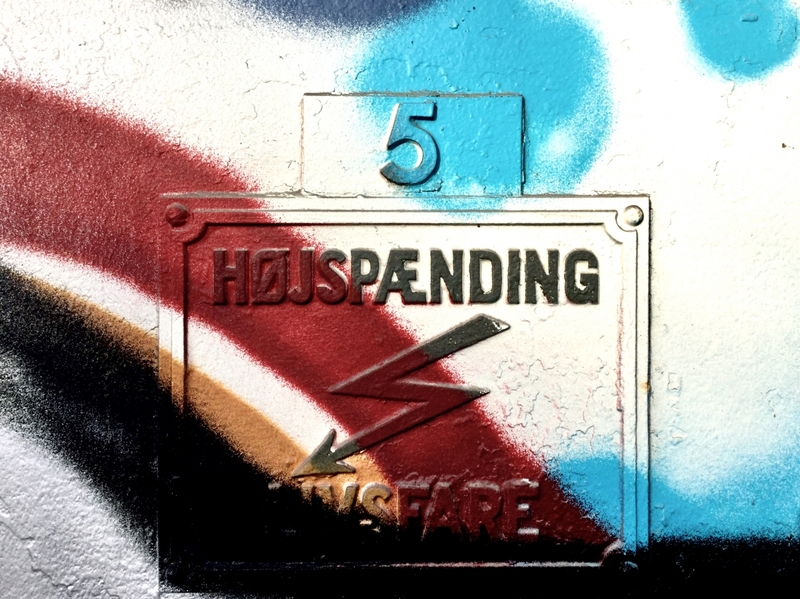 For a number of years, he had been an employee on the island of Hven, where the famous stronomer Tycho Brahe (1546-1601) had not one, but two of them. Later, Longomontanus had become the first Danish professor of astronomy, but he lacked a proper place from which to observe the heavens. Tycho Brahe’s observatories had been torn down, and the only university observatory that yet existed was in Leiden, Holland. It was this problem that was rectified when the Round Tower was completed in 1642. However, prior to its construction, a process took place that is not entirely clear to us. Already in 1630, Longomontanus applied to the university for permission to build an astronomical observatory in his future residence but we do not know if anything happened. We also do not know what considerations were made regarding the location of the official university observatory. However, that has not kept people from making qualified guesses. 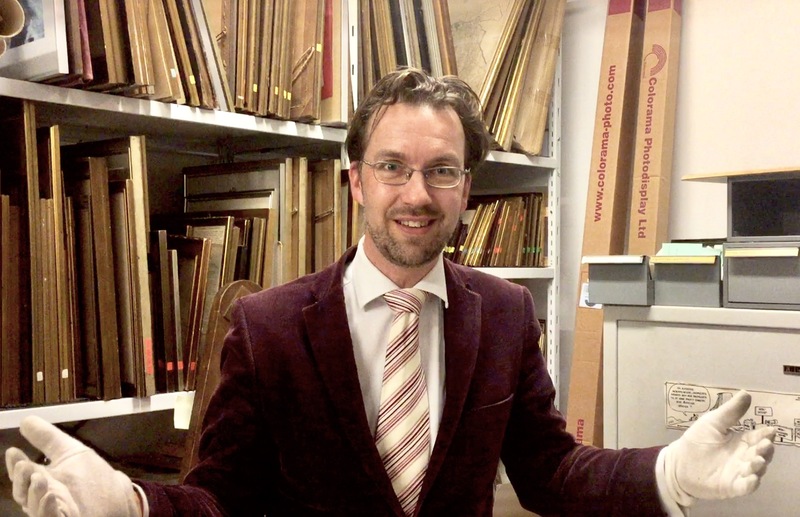 The art historian Jan Steenberg (1901-71), who has worked extensively with the Round Tower, writes, for example, that Longomontanus had “spoken to the King about building an observatory on Valby Hill, in order to resume at long last in Copenhagen Tycho Brahe’s illustrious activity on Hven”, and he even claims that “the plan was supposedly close to its realization”. 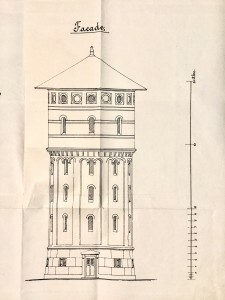 The former Round Tower observer Andreas Nissen chimed in with a remark that Longomontanus “had first proposed the high and free-standing Valby Hill as particularly well-suited for this purpose”. 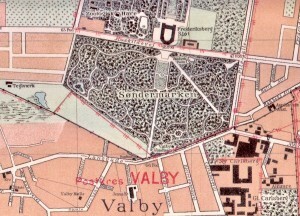 Indeed, Longomontanus did express his predisposition for Valby Hill, which was then a good distance outside of Copenhagen. 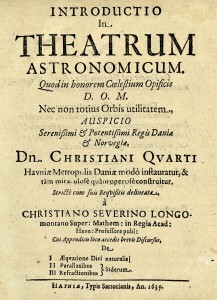 In his book Introductio In Theatrum Astronomicum (Introduction to the Astronomical Theatre), he writes that “A place should be constructed for the setting up of the instruments listed, and unconditionally constructed at such a height that the horizon all the way around as far as possible is open to view, as is the case with the island of Hven; likewise, these are the conditions of the hill outside of Copenhagen which is called Valby Hill”. 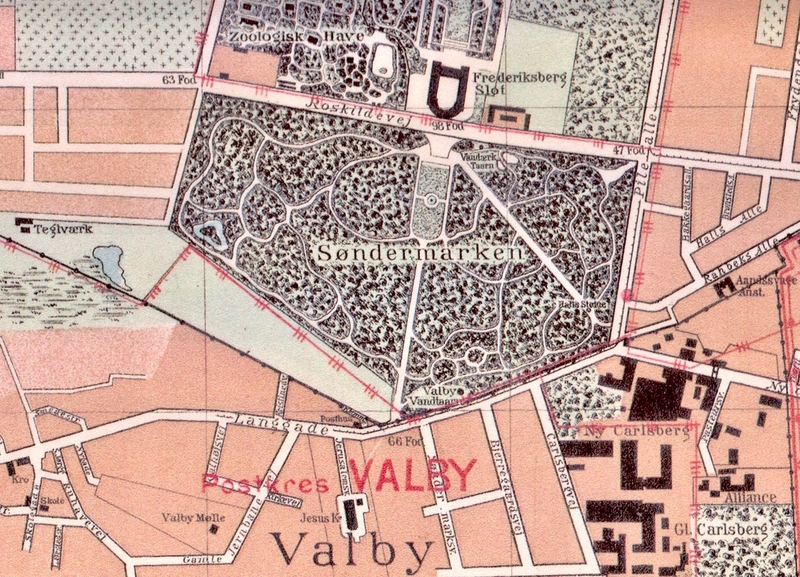 However, Longomontanus’ mention of Valby Hill is from 1639, which is two years after the foundation stone was laid for the Round Tower. It is possible that it refers to earlier thoughts and discarded plans, but we do not know. And at all events, Longomontanus is busy bidding his support for the new astronomical tower, which is under construction in the middle of the King’s Copenhagen, next to the student dormitory Regensen. “But just lately”, he thus writes, “with the help of God and under the command of our sovereign King, this tower is built here in Copenhagen, and Regensen’s sanctuary for the students is added to it. The complex of both buildings becomes (if it, by divine grace, is capable of achieving its ideal form) so great and of such magnificence in its marvellous structure, that nothing equal or similar can be found anywhere in Europe”. His majesty the King and Longomontanus were later mentioned in beautiful harmony in a Latin inscription, which used to exist on the wall of the Round Tower, as it was noted in a description from 1748. 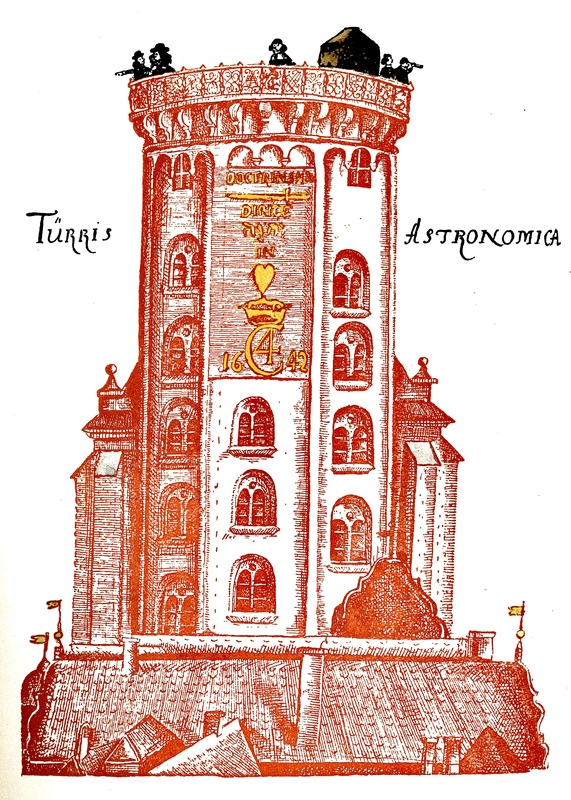 The inscription said that the tower was “founded by Christian IV, who as his advisor employed the very famous astronomer Christen Longomontanus, professor at the university and Tycho Brahe’s disciple”. 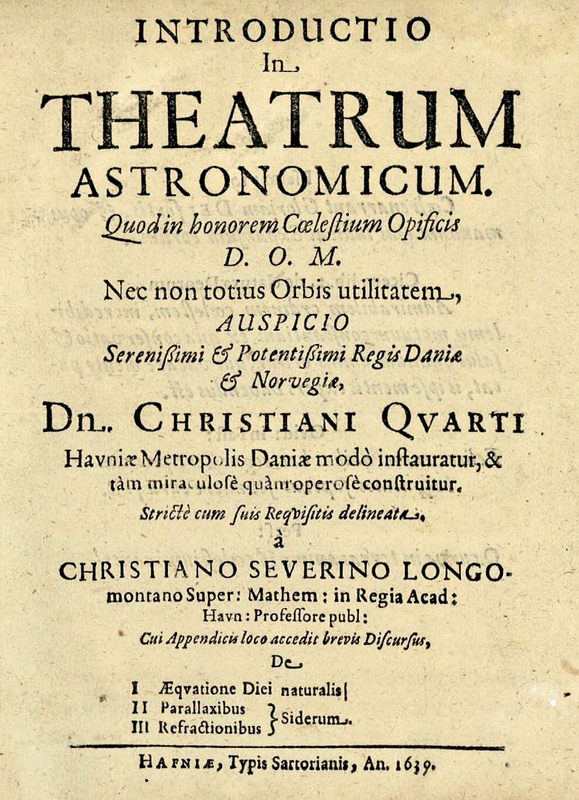 Thus, the Longomontanus book from 1639 also deals with many other topics than just the location of the new observatory, which is called an astronomical theatre, because the word theatre is etymologically derived from the Greek word for to see or observe. As is well known, that is exactly what you do from an observatory. Tycho Brahe became famous, among other things, because his observations were unprecedentedly precise for his time, and in the spirit of his teacher, Longomontanus emphasizes in his book that astronomical science must be based on both theory and practice. He also proposes that future astronomers should be further educated in the Round Tower under the guidance of elderly colleagues – just as Longomontanus himself had been on the island of Hven. In addition, he deals with the question of which astronomical instruments an observatory needs to contain and how it should be organized. To all appearance, the observatory on the Round Tower did not turn out to be quite as Longomontanus had outlined it and if he really wanted to have the University of Copenhagen’s observatory located on Valby Hill, that project did not succeed either. 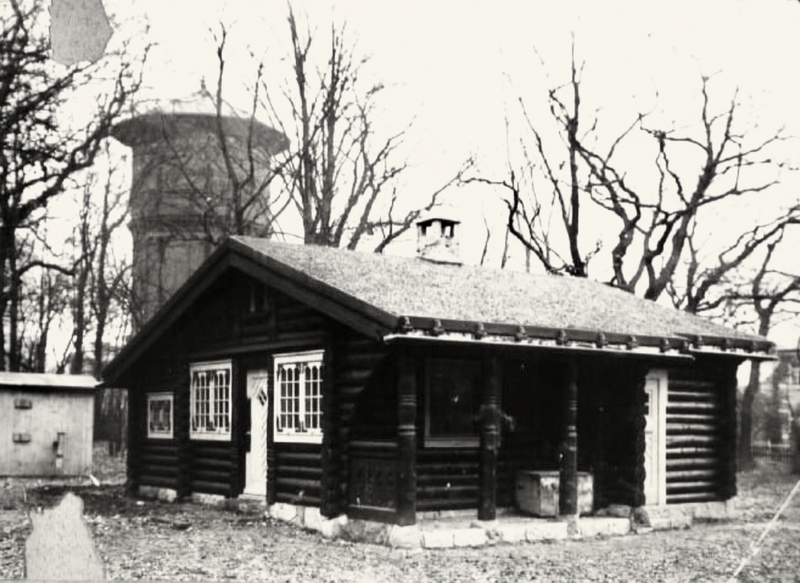 However, although Valby Hill did not get his observatory, many years later it did – strangely enough – get its own round tower. As Copenhagen grew rapidly in the second half of the 19th century, there was an increasing need for a clean and reliable water supply. To get water from the lakes and drilled wells into the small homes required sufficient pressure, and here it was practical with high reservoirs in order to make use of gravity. 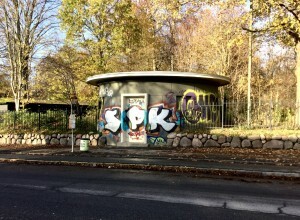 Valby Hill was once again considered suitable, and in the 1850s, on the part of the hill constituted by the park of Søndermarken, the Municipality of Copenhagen built a large water system that would ensure the Copenhageners water at night. 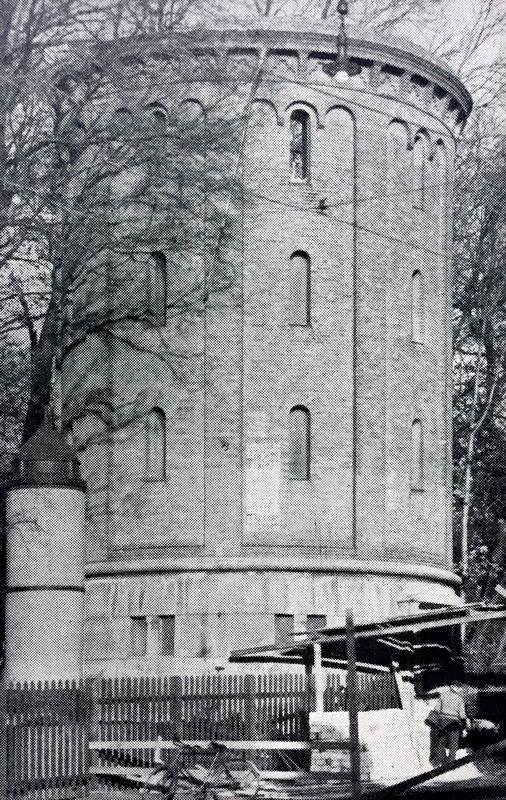 The plant included a water tower, which in 1897 was joined by another one facing the road of Roskildevej, this one built by Frederiksberg Municipality. 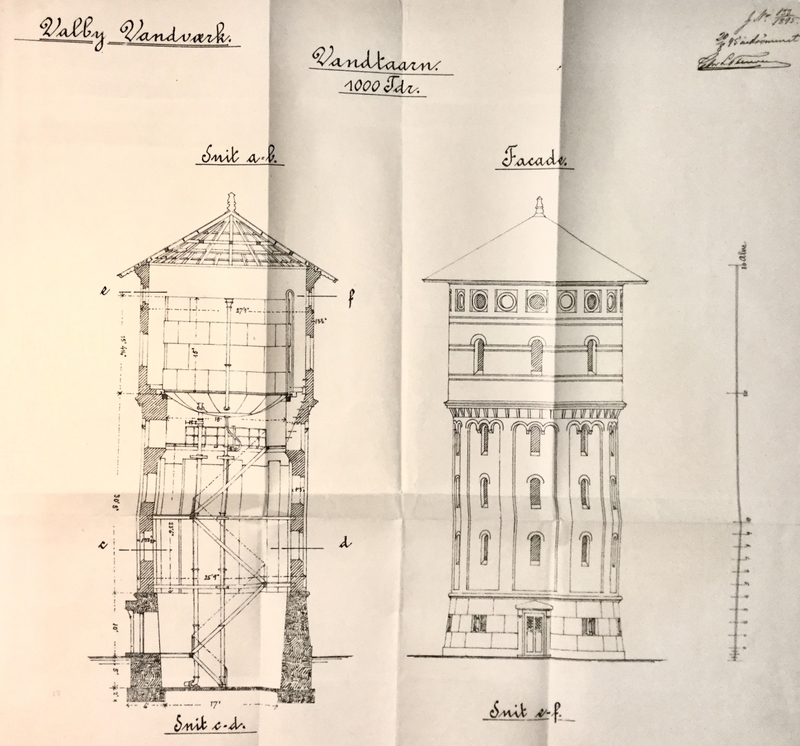 Also in Valby, which at that time belonged to Hvidovre Municipality, they needed water, so in 1895 the municipality was allowed to build yet another water tower in Søndermarken, this time a little further down Valby Hill towards the present street of Valby Langgade. 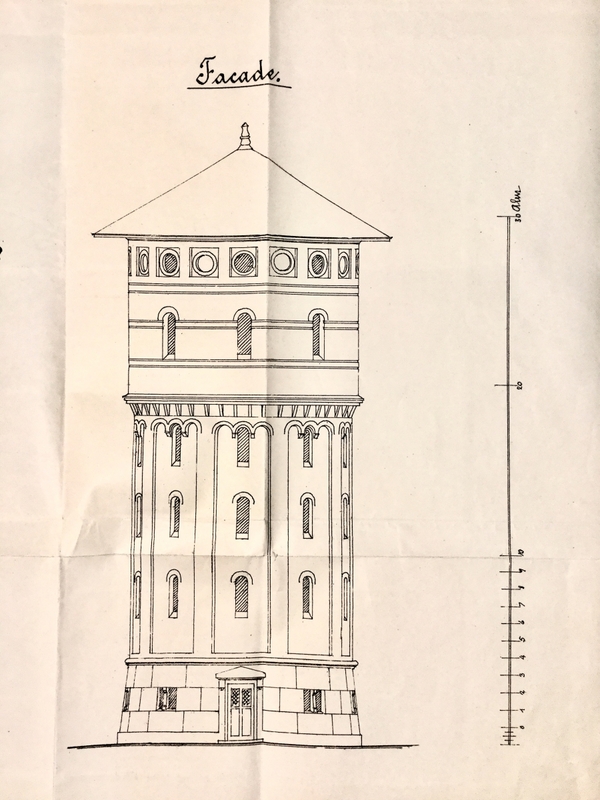 The water tower was just under 19 metres high without its roof, and its lower part had so many motifs in common with the Round Tower that it cannot be a coincidence. Not only was it round, it also had lesenes that ended in rounded arches, and at the top of the base was something that appears to resemble imitation corbels on the sparse image material that is available today. A few years after this tower’s construction, Valby was incorporated into the Municipality of Copenhagen. 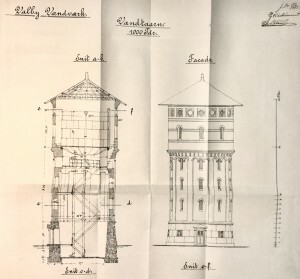 As part of the development of the water supply, the water tower became redundant because “its reservoir had become far too small in relation to the area it was to supply and could no longer play any role as a pressure equalizing vessel with the good supply conditions now available”, as was stated in a description from 1934. The year before, thus, the water tower had therefore been demolished. However, the foundation was allowed to remain and was adapted to become a transformer station. With its round shape, it still brings compliments to Longomontanus and its somewhat taller model a few kilometres east of Valby Hill.